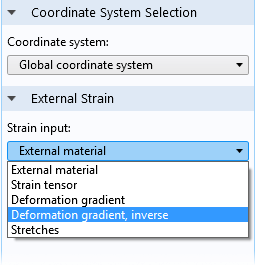 For users of the Structural Mechanics Module, COMSOL Multiphysics® version 5.3 brings a modeling technique called stress linearization, a bolt pretension study step, and a boundary condition for rigid body suppression. 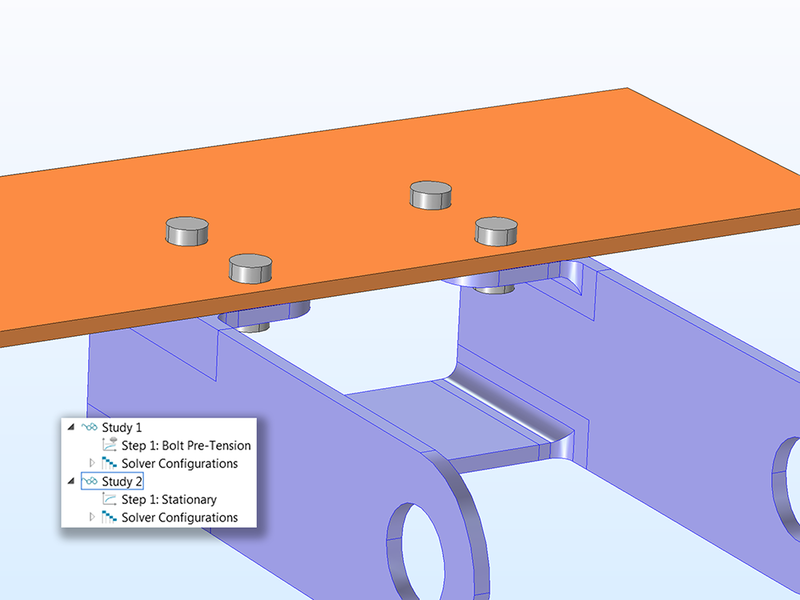 Browse all of the new features and functionality in the Structural Mechanics Module below. Stress linearization is a postprocessing technique where the stresses through a thin section in a solid model are represented by a constant membrane stress field and a linearly varying bending stress field. This type of evaluation is common when analyzing pressure vessels and is described in the ASME standard ASME Boiler & Pressure Vessel Code, Section III, Division 1, Subsection NB. Other application areas include computing reinforcement in concrete structures and some types of weld analyses. The new Stress Linearization postprocessing node makes it possible to select the edges on which a stress linearization evaluation is to be performed. Membrane, bending, and peak stresses are reported and stress intensities are computed for each such stress classification line. Three stress classification lines after being evaluated using the stress linearization technique. The lines (represented by tubes) on the face of the modeled flange show the maximum stress intensity with values as presented in the color bar. 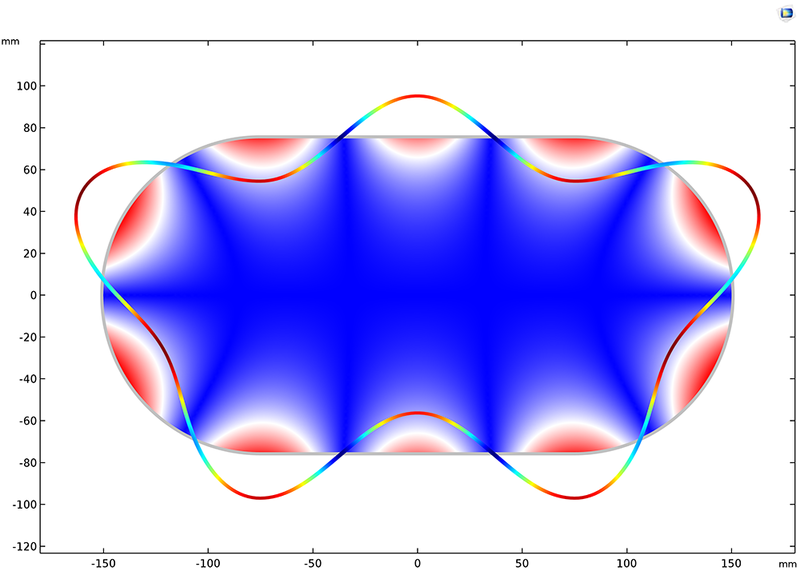 The surface plot depicts the von Mises stresses in the 3D object. Three stress classification lines after being evaluated using the stress linearization technique. The lines (represented by tubes) on the face of the modeled flange show the maximum stress intensity with values as presented in the color bar. The surface plot depicts the von Mises stresses in the 3D object. 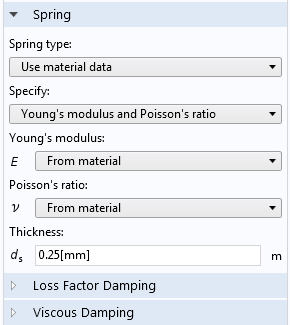 A new study type has been introduced and is intended for the first analysis step in models consisting of pretensioned bolts. The Bolt Pre-Tension study step directly solves for a bolt's predeformation, which is not accounted for in other study types. With this study step, you no longer need to manually set the activation status for the degrees of freedom associated with analyzing the bolts. A design consisting of pretensioned bolts holding a bracket. The first Study node contains the new Bolt Pre-Tension study type in the model tree. The second one would then solve for a stationary analysis. Pretensioned bolts that have been cut by a symmetry plane are now automatically detected. Both the given pretension force and the computed bolt forces of the cut bolt are interpreted as if it were a full bolt, thus greatly simplifying the modeling workflow. Stress plot of a pretensioned bolt that has been cut by a symmetry plane. The cut bolt is detected and treated as if it were a full bolt. This negates having to separately define bolts that have been cut by symmetry planes. All bolts in the model can be specified with the same conditions. Stress plot of a pretensioned bolt that has been cut by a symmetry plane. The cut bolt is detected and treated as if it were a full bolt. This negates having to separately define bolts that have been cut by symmetry planes. All bolts in the model can be specified with the same conditions. 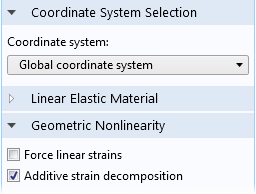 The new Safety attribute to the Linear Elastic Material and Nonlinear Elastic Material nodes enables you to study the use of materials in the structure, particularly with respect to safety factors. The safety factor can be computed with respect to a large number of different isotropic, orthotropic, or anisotropic failure criteria, including user-defined expressions. When a Safety node is included, you can access postprocessing variables for the safety factor, margin of safety, and damage and failure indices. You can now perform linearized buckling analyses in the Beam interface, facilitating the analysis of critical loads for various frame structures under compression. Additionally, models that use multiple and mixed structural mechanics interfaces can now also use this study or analysis type. 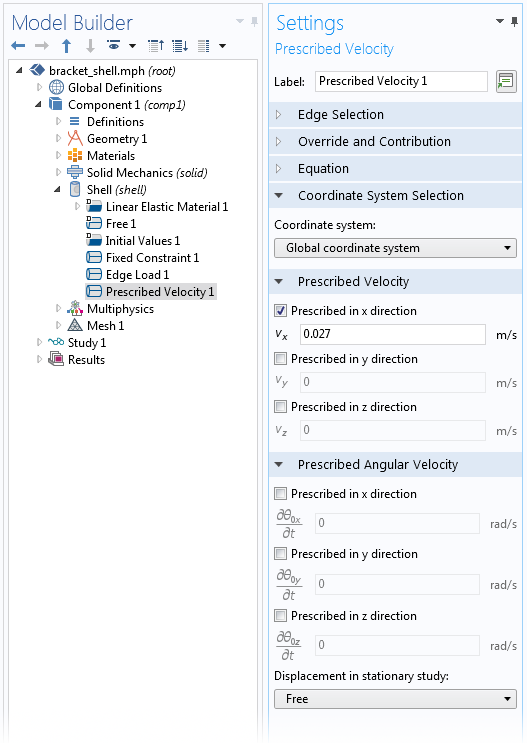 This is because the analysis type is already available in other physics interfaces, such as the Solid Mechanics and Shell interfaces. The buckling shape of a space frame subjected to vertical loads. The buckling shape of a space frame subjected to vertical loads. Many thin structures can be analyzed using shell elements and boundary meshes instead of 3D meshes in order to save computational resources. However, it can be difficult to visualize what is meant to be a 3D structure with results that differ between the top and bottom surfaces of the shell if you have to use shells in the postprocessing step. This becomes even harder when visualizing them effectively together with other 3D parts of your model, analyzed using 3D meshes. 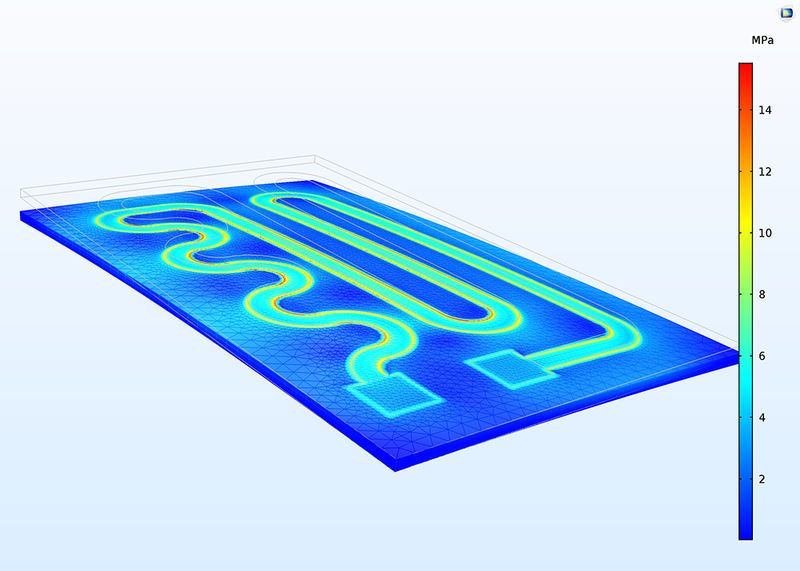 With the new release of COMSOL Multiphysics®, you can plot results from a shell element analysis on two parallel surfaces and present them more effectively in a 3D visualization. By default, the surfaces are separated at a distance equivalent to the thickness used in the shell element analysis. Yet, you can manually modify this separation to improve visualization of very thin objects. All of this is achieved with the new Shell data set under the Results node. 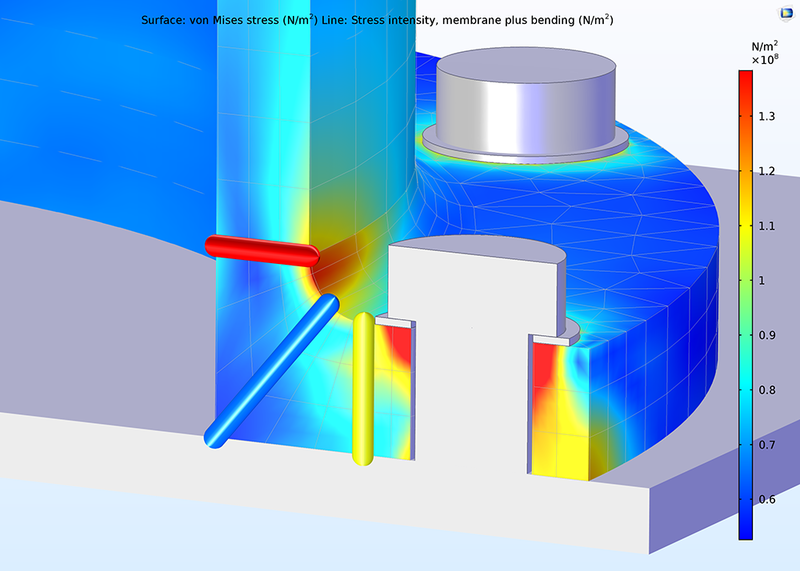 Stress analysis of a bracket where certain parts of the geometry are analyzed using the Shell interface and other parts use the Solid Mechanics interface. When a Shell analysis is used to analyze the shell elements of this geometry, the default plot (shown here) presents the shells as two parallel surfaces separated by the thickness parameter of the shells, with the top surface colored in blue-green, while the parts of the geometry are 3D in nature have been hidden. 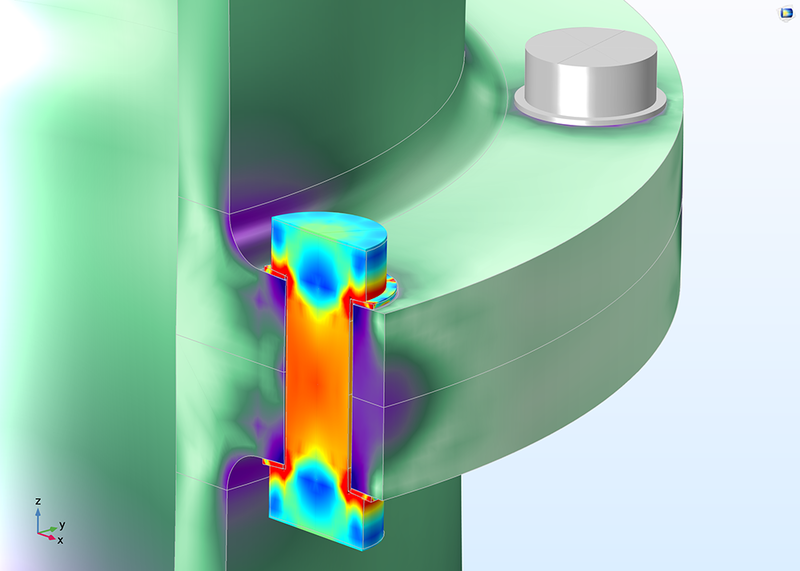 Stress analysis of a bracket where certain parts of the geometry are analyzed using the Shell interface and other parts use the Solid Mechanics interface. The plot here shows the stresses on both sides of the shells using the Shell data set (results on parts of the geometry modeled by solid elements are not shown). Connecting different structural mechanics interfaces has been made significantly easier through the introduction of three new multiphysics couplings interfaces: Solid-Shell Connection, Solid-Beam Connection, and Shell-Beam Connection. As a result, the previous subnodes that could be added under the Solid Mechanics node — Beam Connection, Shell Connection, and Solid Connection — are now obsolete and have been removed. The Solid-Shell Connection and Solid-Beam Connection couplings are useful for connecting domains from either the Solid Mechanics or Multibody Dynamics interfaces. The available connection settings for the (from left to right) Solid-Shell Connection, Shell-Beam Connection, and Solid-Beam Connection couplings. 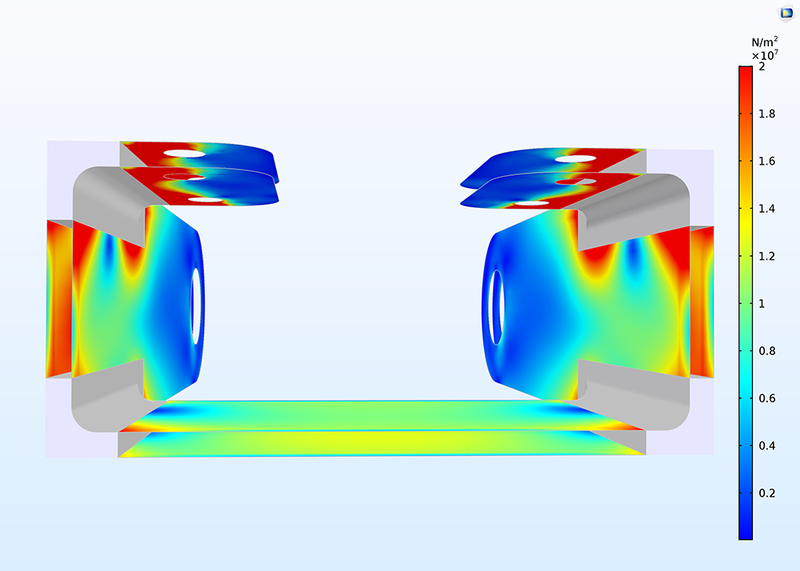 A new mode analysis study type has been added to the Solid Mechanics interfaces in 2D. Mode analysis is used to study mode shapes and wave numbers for waves traveling in the out-of-plane direction. Applications include general acoustic-structure interaction and nondestructive evaluation on cross sections. 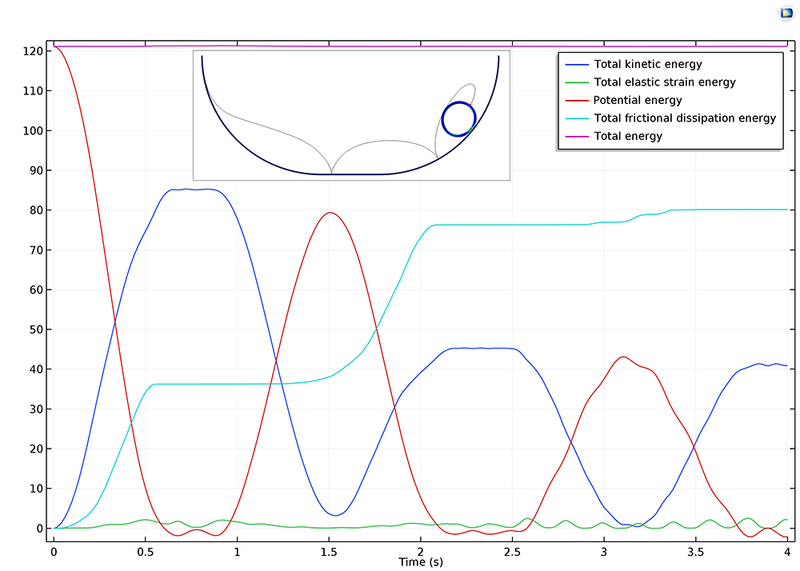 The Solid Mechanics interface in 2D axial symmetry has a new option for Circumferential mode extension and can be used with an Eigenfrequency study for computing circumferential mode shapes and mode numbers. Note: The model in the example also requires the Acoustics Module. 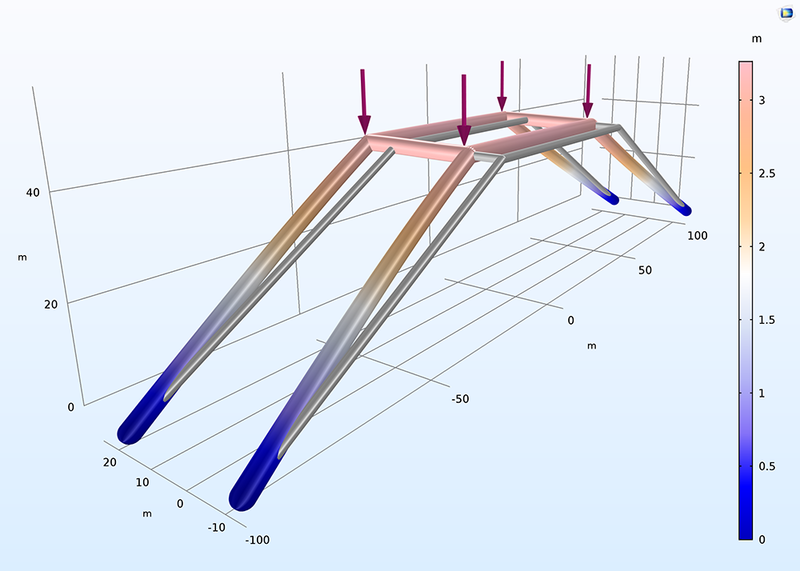 Propagation modes in the chamber of a muffler with thin elastic walls. Acoustic pressure and structural deformations are shown. Propagation modes in the chamber of a muffler with thin elastic walls. Acoustic pressure and structural deformations are shown. 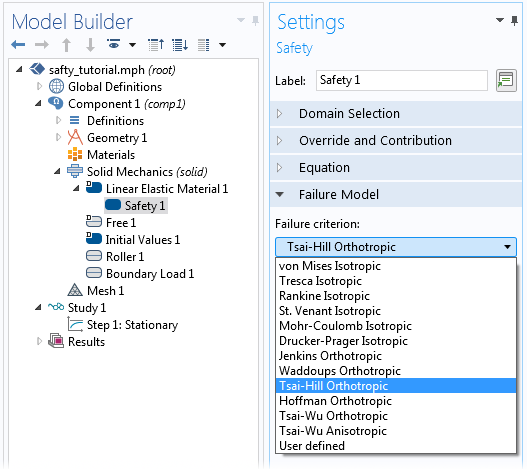 The Rigid Domain material model is accessible from the Shell and Beam interfaces. This is an efficient modeling technique for parts that are significantly stiffer than their surrounding parts, since it only requires the degrees of freedom of a rigid body for an entire set of boundaries (Shell) or edges (Beam). Just as for the corresponding material model in the Solid Mechanics and Multibody Dynamics interfaces, you can apply loads, springs, and inertia at arbitrary locations on the rigid body. 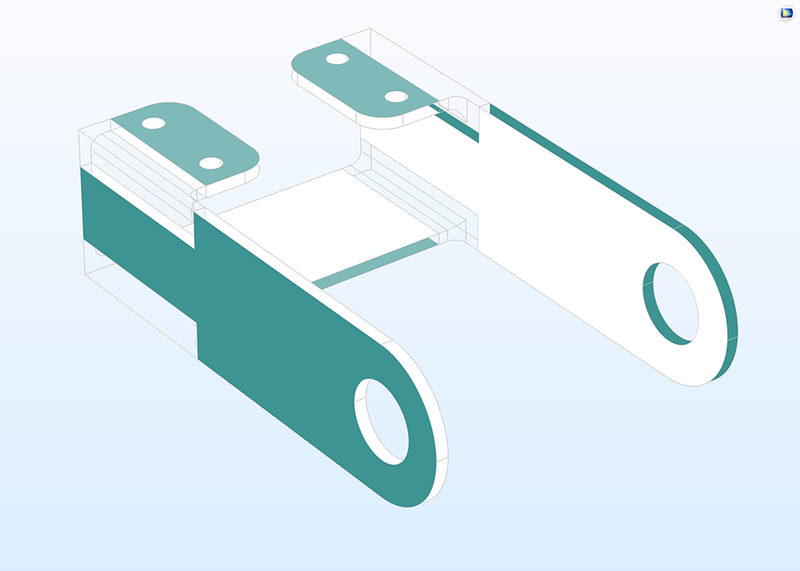 The Rigid Connector feature is now available for use in the Beam interface. A set of nodes can be selected to form a rigid region and be used, for example, to avoid overestimating the flexibility at beam connections. It can also be a means of applying off-center loads, springs, or extra inertia contributions. 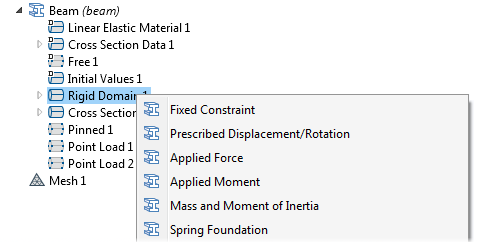 Switching between showing and not showing physics symbols in your model setup in the Graphics window. You can select the Enable physics symbols in the main node's (e.g., Solid Mechanics) Settings window (top) as well as in a single feature's (e.g., Point Load) Settings window (bottom). 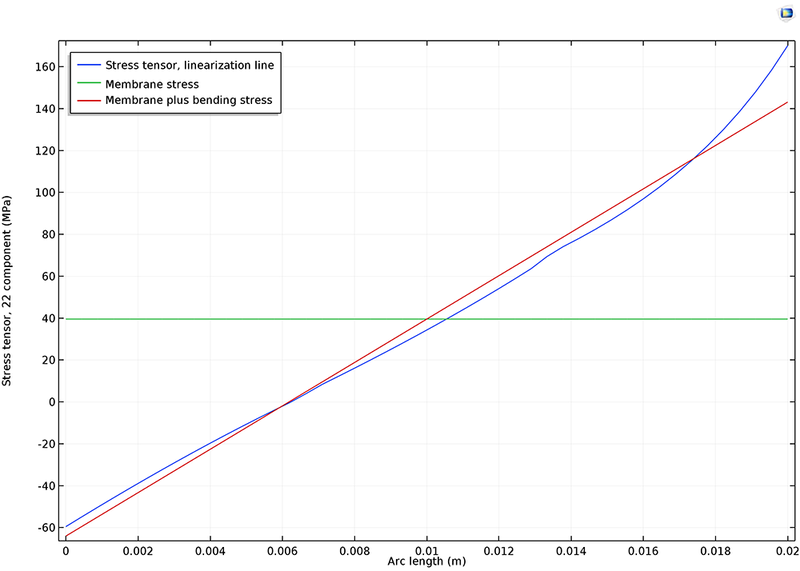 The Transient Rolling Contact example shows the concept of how to handle a transient contact problem with stick-slip friction transition. A soft hollow pipe subjected to gravity load is released at the top of a half-pipe. Its motion varies between sliding and rolling, depending on its position in the half-pipe and its velocity. The cross section of the pipe changes its oval shape due to contact and inertial forces. An energy balance validates the accuracy of the solution. A soft pipe is dropped from the top region of a half-pipe and its motion and shape of the pipe's cross section is subject to gravitational and contact forces. Shown are the stresses in the pipe at a point in time as well as the trajectory of a point on the pipe as its motion varies between sliding and rolling. Note: This model also requires the Multibody Dynamics Module and the Acoustics Module.